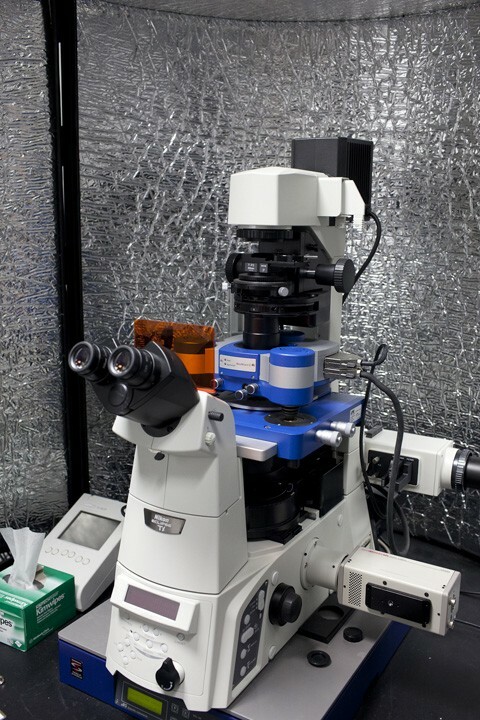 For biological research we have a number of AFMs integrated with optical microscopes to be able to use both techniques simultaneously. This is a useful combination as the techniques give different information on the sample. The AFM can be used for high resolution images of surfaces as well as for mechanical characterization or manipulation of samples while optical microscopy can be used for 3 dimensional tomography or to follow expression and distribution of fluorescently tagged proteins in cells. Like all other commercial AFMs these systems can optionally be used with temperature control, fluid exchange and magnetic tip activation. Please note that the confocal AFM systems can be booked for commercial and academic use. Figure 1: Combined Asylum Research MFP-3D AFM and Nikon Ti/E fluorescence microscope. The Nikon microscope is equiped with a confocal scanhead (A1R, resonant scanner, spectral detector, VAAS, 4 lasers with 7 lines) on the left and an Andor EMCCD camera on the right and with lenses ranging from 10x/0.3 to 60x/1.49. This microscope is also capable of TIRF microscopy and has a PerfectFocus unit for maintaining focus over long time periods. Currently this is the only instrument in Ireland to combine Confocal and TIRF microscopy with AFM. Figure 2: Combined JPK Nanowizard II AFM and Nikon Ti/E epi-fluorescence microscope. The microscope is also capable of phase contrast and polarized light microscopy as well as differential interference contrast (DIC). It is equiped with a sensitive Hamamatsu CCD camera and lenses ranging from 10x/0.3 to 60x/0.6. Fluorescence uses the fact that some molecules absorb light of a specific colour and subsequently emit light shifted to the red side in the spectrum. The emitted light can than be efficiently separated from the excitation light, allowing optical imaging with low background and a high signal to noise ratio. TIRF (Total Internal Reflection Fluorescence Microscopy) is a technique that enables well defined fluorescence images near a surface. Because of a difference in refractive index, light will be reflected at the interface if the incident angle is large enough. There will however be a thin layer above the interface where the lightwaves decay to zero. This can excite fluorescent dyes and thus can be used to image this layer without exciting any molecules further away from the interface. Confocal microscopy is another technique that enables better defined fluorescence images by focusing the excitation light to a diffraction limited spot and using a pinhole to block all emitted light that does not originate at the focus point, as depicted on the left where the green light is mostly blocked while all orange light passes through the pinhole. By scanning the focal spot through the sample a high resolution 3 dimensional image can be built up.